Are you ready for Back to School? Here in the northeast, there’s still another month of summer vacation, but many school systems across the country are gearing up to go back soon. 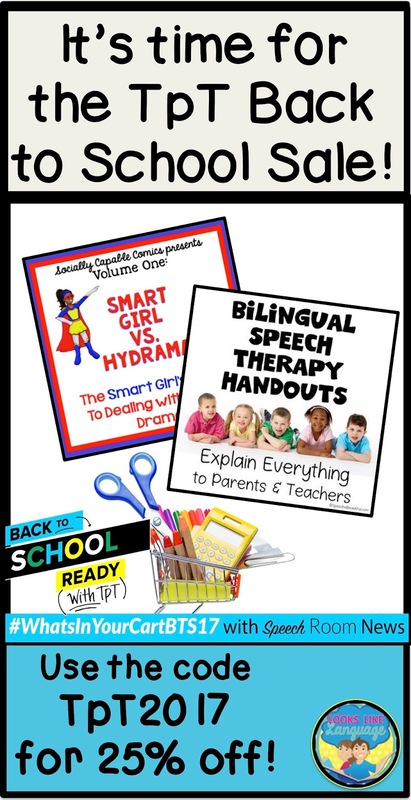 Of course, that means it is time for the TpT Back to School sale! It’s your chance to get 25% off everything in my store if you use the code BTS2017! Don't be like me and forget to put the code in! Now, you know that I am delighted to be working on products for you full time now, but I thought I’d take a peek at some new products you might be interested in. 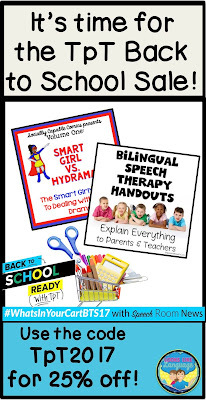 Do you have students who come from a bilingual home? This new packet by Sarah Wu- Speech is Beautiful looks amazing if you do. It can save you so much time, compared to writing you own and then finding someone to translate for you. 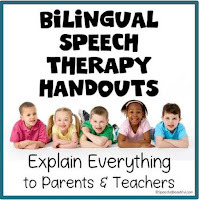 And since Sarah is both bilingual and an SLP, you can be sure that the information is just right! Check it out here. 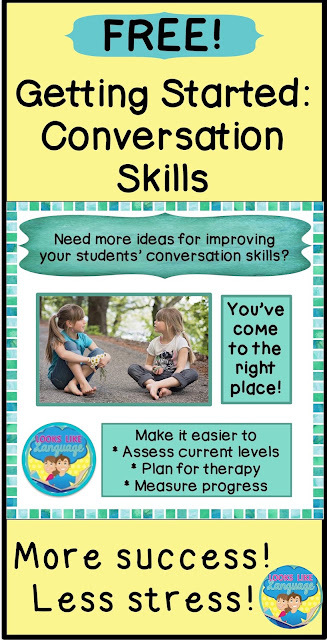 If I was going back to my caseload this year, this new social skills comic book by Smartmouth SLP would definitely be in my cart! 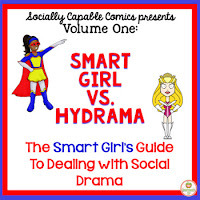 Middle school girls can show a lot of drama, and the cartoon set up provides a great way to open up those discussions! You can find it here. One of my newest products can also save you a lot of time! Although my passions are autism, social skills and mixed groups, I’ve also done a fair amount of articulation therapy in the (40 years time SHH!) since I started treating! I know how time consuming it can be to not only plan for therapy, but come up with homework as well. 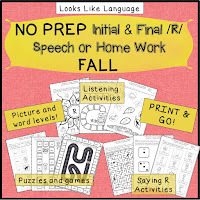 This NO PREP set can be used for therapy activities and then sent home for homework! Parent instructions are included, too! 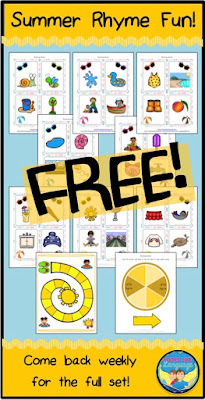 The set is very adaptable, working on the R sound from listening skills through words and sentences, and includes picture level worksheets as well as pages with words for readers. Check to see how much time this will save you here. Have fun filling up your cart! 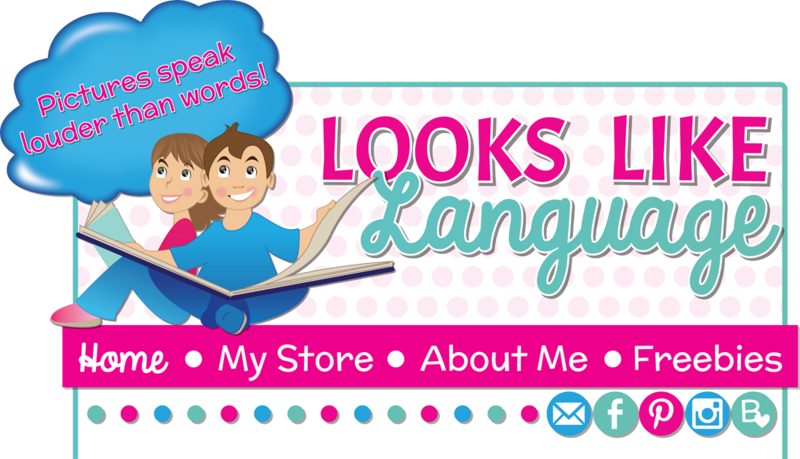 Labels: Resource Links, TpT Sale! 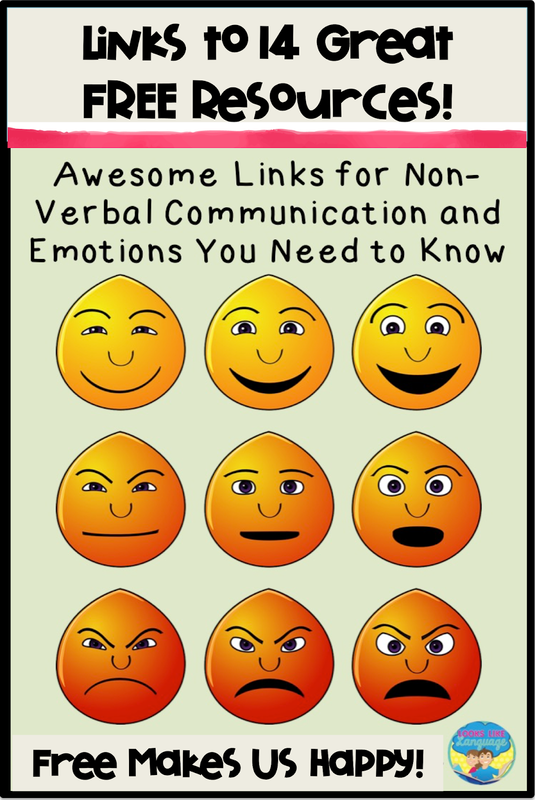 14 AWESOME Resource Links for Social Skills! Have you ever looked at the pile of materials you own and realize that you still don't have exactly what your student needs? Between differences in how they learn, what activities they enjoy, and how much practice is needed, I know that looking for resources can seem never-ending. How about FREE awesome resources? That is why I love to look for free help. 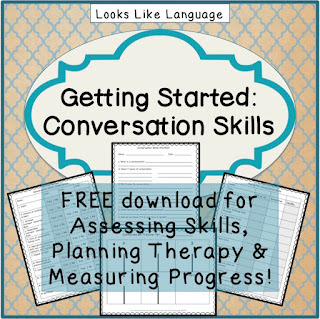 And, of course, I want to share these resources with you! 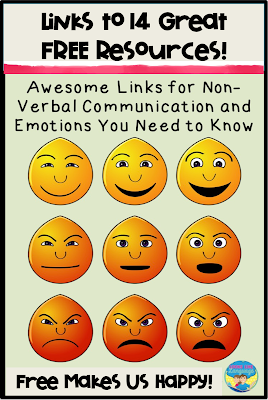 I found a treasure trove of online ideas and activities for working on emotions and nonverbal language skills. 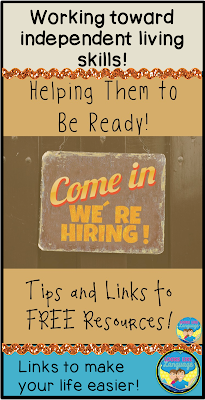 I checked to make sure that the links are still working, but instead of reposting the whole thing, I'm just going to ask you to click here for some amazing free resources. 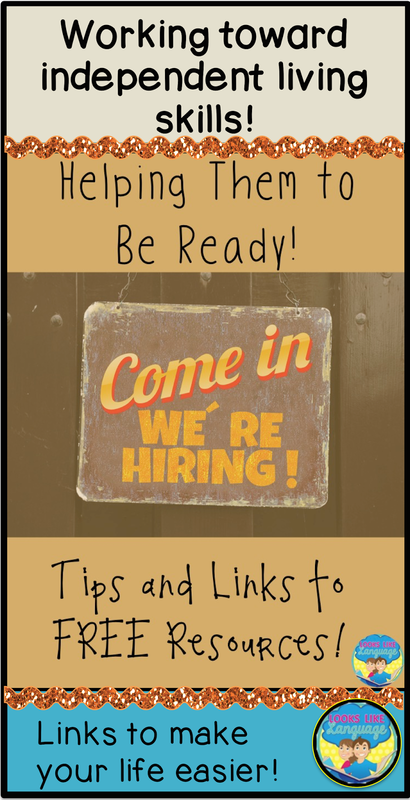 You know that you can always find ready-made help at my store. And if you haven't signed up for my newsletter yet, why haven't you? It will get you access to tips, freebies, and news. Your email will be collected solely for receiving my newsletter. No spam! 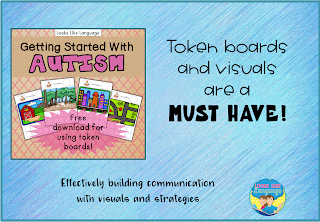 Sign up here to get my FREE Getting Started with Autism Guide!